My family just came back from a week long vacation at Disneyland, so I’m still dealing with vacation blues while I try to get into the Halloween bento swing. My aunties paying a visit from Hilo while on their trip to Honolulu helped give me motivation to make a Halloween bento and this is what I came up with. To cut the nori eyes, use a small single hole puncher. You can also use the scissors I have, a micro-tip scissors , which is amazing for cutting tiny details! 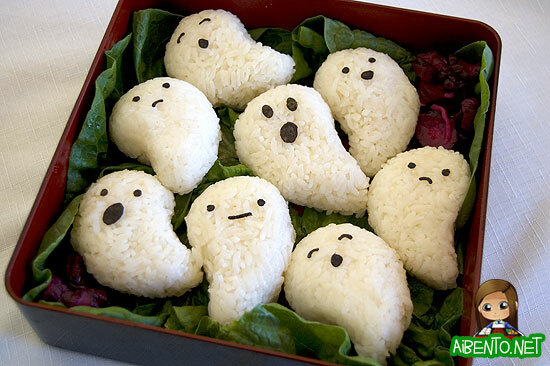 First layer of the bento was made up of ghost musubis, which I shaped using saran wrap and then added nori cutouts. I could have made them cuter but I ran out of time. This is the stuff I’m really proud of: hot dog fingers. LOL! Aren’t they utterly disgusting? I cooked them in shoyu sauce and used a teardrop cutter to make the nails. I’ll post a tutorial tomorrow about it. 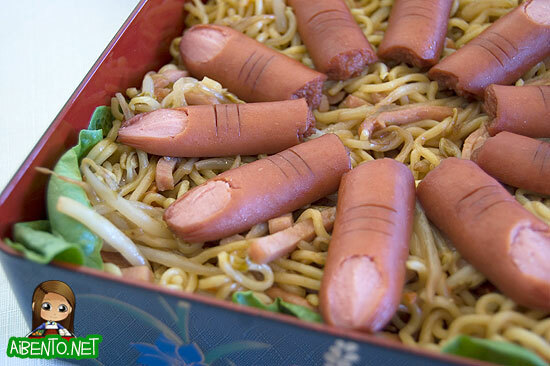 They rest on a bed of yakisoba noodles.